Author Jean Russell Nave will be at the Three Rivers Humane Society booth, Dec. 8. Three Rivers Humane Society, in Madras, operated by Jerilee and Steve Drynan, are hosting author Jean Russell Nave at their booth, Dec. 8, during a Christmas event at the fairgrounds. Nave learned about the outstanding care offered by Three Rivers Humane Society when she and her husband adopted a bonded pair of Scottish terriers from the facility. 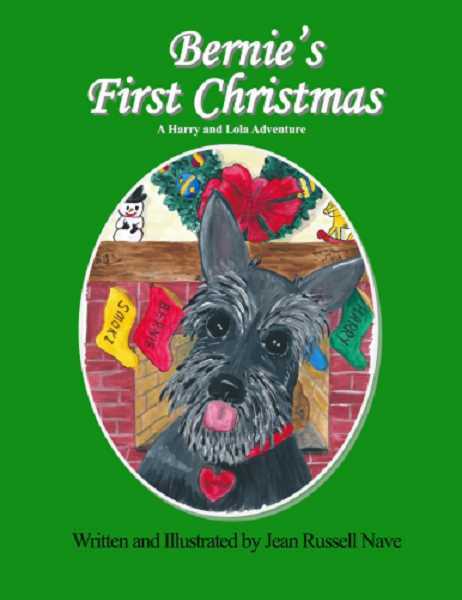 Soon after the adoption, Nave decided to write another children's book, "Bernie's First Christmas," dedicating the royalties to Three Rivers Humane Society. The new book, part of the "Harry and Lola Adventures" series available on Amazon.com, is a somewhat true story of their rescued Scottie, "Bernie." Nave became an author 1984 when she began working as a corporate motivational speaker and trainer. She also spent time as a cable television host for two series, and she had numerous self-help books published before retiring to Central Oregon in the 1990s. After retirement, she and her husband became involved with adopting rescued Scottish terriers and learned how badly rescue organizations needed financial support. After a short time, she began writing and illustrating what became a series of children's books about Harry and Lola, her bonded pair of rescued Scotties. All author's royalties of the first five books went to Aberdeen Scottish Terrier Rescue, which was Oregon's breed specific rescue group at the time. A few years ago, that organization moved out of Oregon. The author took a break from writing books while dealing with cancer. Once she was healthy again, she and her husband adopted the pair of Scotties from Three Rivers Humane Society. The excellent care the organization offered the Scotties, and the joy of having more dogs in the house again made Nave think about writing the new book. "Before cancer, I'd take the three Scotties we had to Black Butte Ranch and Eagle Crest to read to kids in their recreation centers. The Scotties loved visiting with the children and the youngsters were thrilled to meet and play with the dogs after hearing a story about them," said Nave. "Jerilee Drynan and I decided that I'd bring the real Bernie with me to her booth at the Holiday Market at the Jefferson County Fairgrounds on Dec. 8. Youngsters will be able to pet and walk Bernie after they hear me read his story, 'Bernie's First Christmas,'" she said. Copies of the book will be available for sale, supporting Three Rivers Humane Society. The book is also available on Amazon.com or at Paulina Springs Books in Sisters. For more information about the event, call 541-475-6889.